Escape Room the Game easily has some of the most unusual technology of any tabletop escape room experience. When you open the box the first thing you will notice is a giant plastic mechanism with codes and ciphers stamped into the side, a bunch of strange plastic keys, and several bags - each one containing their own scenario. These elements makes Escape Room the Game truly unique and worth exploring. That this box contains not just one but four different rooms is pretty amazing for the modest price of $40. When you add in the custom plastic keys and the “Chrono Decoder,” you know you’re in for a different kind of experience. The countdown timer adds tension, while sliding the keys into place and checking to see if you’ve found the right answer adds a physical element that sometimes feels lacking in other escape room products. The hint system is utilizes red filter technology and players are allowed to look at hints after enough time has passed. We ended up looking at hints even if we didn’t feel like we were behind, and on at least one occasion the hints caused us more trouble than they helped. Overall it’s a great system, but it doesn’t always work. When it works, the Chrono Decoder is a great prop that also tells you when to look at hints. Escape Room the Game has expansion packs that utilize the Chrono Decoder provided in the base box. The themes are nice, but fairly standard for escape rooms. Sometimes the Chrono Decoder doesn’t accept the correct keys, which penalizes you time and stalls out the game play. A couple of the puzzles are very poorly designed. It’s no good for more than four players and, except for the Nuclear Countdown room, is best with three. As much as our group enjoyed Escape Room the Game I can’t recommend it wholeheartedly. It is in turns rage-inducingly frustrating and stunningly brilliant. The Prison Break isn’t a great starting scenario and the Temple of the Aztec is the worst of the lot. (Aztec felt like it needed a couple of extra components that were removed at the last minute.) The best scenario in the starting box set is the Nuclear Countdown room; just make sure you have a charged cell phone ready when you play it. Stephanie Frey can be found roaming Twitter. She can also be found selling goodies on Society6. Posted on August 13, 2018 by Stephanie Frey and filed under Escape Rooms, Computational Thinking, Libraries / Ready to Code, Tabletop and tagged escape room tabletop Escape Room The Game. Webby’s Challenge premiered at ShushCon 2018 and we made a couple modifications from the Print and Play Model to spiff it up. The biggest modification was the Breadboard puzzle. We used some Breadboard and wires that we had laying around to give participants a more tangible experience in place of the default circuitry puzzle. The following puzzle replaces the Circuit Puzzle in Webby's Challenge, but can be used as a standalone puzzle or incorporated in a different Escape Room all together. Print the Breadboard Puzzle Kit. Set out the 3x Very Important sheets, Instructional sheet, Breadboard, Battery Pack sans batteries, all the wires, and LEDs. Set the 2x AA batteries with one of the sets of clues that players need to unlock. Make sure it isn't the stack that unlocks from solving this puzzle (Answer:3220). Fun Fact: The reason there are no Red LEDs in the room is due to technical difficulties we had with them burning out and smoking. Make sure to try out various setups ahead of time to make sure all of your LEDs are in working order, and be sure to keep spares on hand. In this puzzle, participants find the LEDs, wires, Breadboard, instructional papers, and battery pack scattered in the room but not the 2x AA Batteries. This keeps participants from immediately burning out the batteries by touching the positive and negative charges together. It also gives them time to read the various instructional warnings laid out on the table before they truly get started on the puzzle. The batteries will be unlocked with which ever answer they correctly solve first. If using lock boxes with Webby’s Challenge, then put the batteries in either the Robot Path or the Colored Shapes lockboxes. Participants will use the parts list to make sure they have all of the pieces they need. They’ll then use the list with the various numbers and letters to place the wires and LEDs in the correct sections of the breadboard’s grid. They’ll also have to make sure to put the batteries into the battery pack. Once everything is assembled the LEDs will light up and participants will be able to see what colors the LEDs are. They’ll use this information with the colored boxes page to get a 4 digit combination either to give to the moderator or for a 4 digit lock, or if you’re feeling extra spiffy, a 4 digit color lock. Posted on May 8, 2018 by Stephanie Frey and filed under Libraries / Ready to Code, Tabletop, Escape Rooms and tagged escape room. Webby’s Challenge is an Escape Room designed by Stephanie Frey of the Georgetown County Library System for the Ready to Code Toolkit. It is an experience meant to be used as either an introduction or supplementary material to Computational Thinking and Coding Activities. It starts with a variety of framework puzzles to get participants in the right mindset and as they unlock new clues they delving into coding shapes through Khan Academy. Webby’s Challenge requires a computer and internet access. The experience can be embellished with the use of lock boxes, like from a Breakout EDU kit, but they are not required. If not using lockboxes participants will give their answers to the Moderator who will then give them their newly unlocked clues. It works best with ages 10+ youths and can be played by 3 - 6 players. We laminated our Colors and Shapes page and used dry erase markers instead of covering the squares. First, print out the kit. It has all of the physical puzzles you’ll need. All the items on pages 1-9 will be available to players upfront, as well as all the numbers only coordinate slips. Cut out everything with a dotted line; scatter or hide the pieces as appropriate. Hiding pieces works better with younger age groups, while hidden pieces may stump older players. Any left over scraps can be cut up and used by players to cover the squares of the Colors and Shapes page. Pages 10 - 14 will mostly be clues that players need to unlock. Gather up all of the other pieces into their proper groups. If using lock boxes, set your locks to each answer and put the assigned materials in each box. If not using locks, make piles of each material. You may want to use a note on top to differentiate when participants receive each pile. Make sure to have a computer available for players to use. Setup a final item for your players to discover once they’ve solved the final puzzle. What the players unlock from the final puzzle can vary greatly. The story line I usually run is one where Webby an infamous hacker has stolen government documents and the players are trying to pass her trials to retrieve them. I usually have the players unlock redacted government documents out of a final safe. The story you run can vary depending on what would be interesting for your players and the stakes can be as great or low as you think interests them; Whether it’s Webby has locked them in a room filling with poison and players must solve the puzzles to escape, players must retrieve some candy she stole, or whatever story you want to tell as the Moderator. If you want to run the story I’ve provided you can read the paragraph below for your players and embellish it as you please. Webby is an infamous hacker. Recently, she’s stolen some important government documents. You’ve been sent in as a team to infiltrate her hideout and recover what she’s stolen before it can get into the wrong hands. Webby however has left a number of puzzles to test your skill, and if you can overcome her trials she’ll let you take the documents. Make sure to tell your chosen set up story to the players. Explain what parts of the room don’t need to be moved or touched, such as if you have a room with bookshelves or pictures frames that are completely unrelated. Also explain to your players that if they get stuck they can give the Moderator one of the hint cards to help them through the experience. It’s best to give hints that point players in the right direction without giving them the answers; Such as, pointing out what pieces players haven’t used yet, asking what sets of pieces might have in common, and other leading questions. This statement shows that any suns that are green will be uncovered. If the sun however is any other colors then the space is covered. Players assign directions they find in the room to specific shapes. When the Robot Token is on a shape then it will follow the command that’s been assigned to that shape. Players needs to get the robot to the end of the maze. The order of the directions is the answer to the puzzle. Players use the KhanAcademy guide to help them determine how to fix the broken code. Once players have fully repaired the code, a picture of a mouse will appear with the word MOUSE under it. MOUSE is the answer to this puzzle. Players use the slips of paper that they find throughout the room. They organize them by font. Players then replace the (x,y,h,w) of lines of code with the coordinates they’ve found. Through this they use code to create shapes that form numbers. This gives them the final answer for the room. We replaced the circuit puzzle with a breadboard. It isn't necessary, but it is pretty cool. Posted on May 2, 2018 by Stephanie Frey and filed under Escape Rooms, Libraries / Ready to Code and tagged escape room coding. The Kosmos EXIT series is a destructible escape experience where participants are expected to fold, spindle, and even mutilate, the various provided elements in order to find clues and solve puzzles. As of this writing, the authors have played the first three; EXIT: The Secret Lab, EXIT: The Abandoned Cabin, and EXIT: The Pharaoh’s Tomb. One of the best things about the EXIT games is how they do clues, at least when the system works. Puzzles are marked with symbols such as an hourglass or crescent. When players are stuck they pull a card from the clue deck with the matching symbol. The first card instructs what pages or cards will be needed to solve the puzzle, which is an excellent function of a hint system, while further hints detail the process of solving those puzzles. Unfortunately the signalling is poor at times, meaning players frequently can’t tell when they have all the right pieces for a puzzle, or even which puzzle they should be working on next without actually burning a clue. Add this to the fact that the clue cards sometimes leave out which other game elements are part of a puzzle, both of which mean the EXIT series has some critical flaws. The mechanic for checking answers is fairly ingenious; players check their answers with a wheel, inputting the correct combination beneath the puzzle’s symbol. This reveals a number, players check that card number in the answer deck to find out if they’re correct or need to give it a bit more thought. This keeps players from brute forcing combinations on the wheel like may sometimes happen in Escape Room the Game. As far as puzzle quality is concerned, the puzzles in the EXIT series are a bit of a mixed bag. There are some fantastically creative ones, but they’re mixed in with others that are a bit repetitive or aren’t exceptionally intuitive and cause intense frustration. Fortunately the EXIT games are quite reasonably priced, even for one-use items. 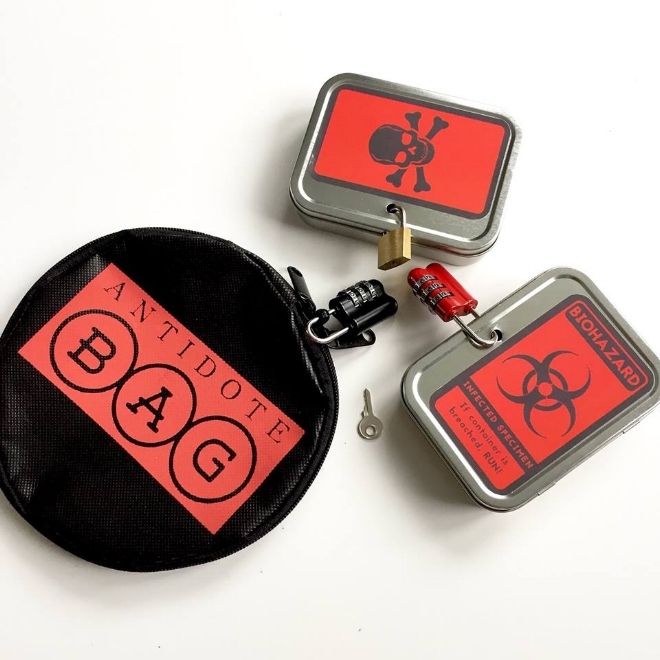 Making them great giveaways or for use in programs, like game nights or escape-camps. However there are several reasons they are not ideal for a library game or puzzle collection. They aren’t terribly suitable for groups above three or four. Too many pieces have to be repaired or replaced for each play through so it isn’t a viable addition to a standing collection. Posted on April 23, 2018 by Stephanie Frey and filed under Escape Rooms and tagged escape room Exit Kosmos board game. Another in our series of tabletop escape room game reviews, and this time we are talking about the Deckscape series. The two sets we’ve played are Deckscape: Test Time and Deckscape: The Fate of London, and this review reflects experiences with those two titles. There are several elements making Deckscape appealing additions to both school and library collections, the most important of which is that there is no reason any of the components, all of which are cards, need be destroyed while playing the game. With an incredibly reasonable price, the included cards are of good size and good quality and all the needed information is clearly visible. With care these boxes should see dozens if not hundreds of plays. One great thing about about Deckscape series is the good density of puzzles in such a teeny box and price point. To get so many in the box there seem to be a bunch of easy puzzles which help build momentum, right up until players hit a wall and can’t progress at all. Which leads us to the most egregious issue; most, if not all, of the Deckscape puzzles have binary fail states. There is no “oh, we were wrong, so let’s go back and try again”. Unlike most other escape experiences, if you get an answer wrong in DeckScape then that puzzle is failed; players then take the penalty, and move on. In other words, players don’t have the satisfaction of working through a puzzle if they get it wrong on their first answer. Unfortunately some of the puzzles seem to be designed to make players fail, the game could have used a bit more testing. At some point in the game Deckscape has players break the deck up into parts as you go through the adventure. These parts are different puzzle chains that intersect with each other, keeping the experience from being narrow and linear by having players work on entirely different puzzles simultaneously. Splitting the puzzle chains also keeps players engaged and interacting with each other as they each have a unique perspective on the tableau of puzzles before them. As you can see Deckscape, as a series, is not without some problems. The order of the cards in the box really matters, because both sides of the cards are needed, and it is essential that they are revealed in a certain order. This differs from the Unlock series where, because of the way cards are revealed during play, most of them don’t need to be in order. Unfortunately having any of the Deckscape cards out of order has a good chance of actually breaking the game flow. Fortunately, the numbers indicating card order are clear and easy to see so it is theoretically possible to sort most of the deck without ruining any major surprises. As with most puzzle games, there are always a couple puzzles that seem designed to force all but the most non-linear thinkers to use hints.The Deckscape hint system is two cards with a list of card numbers and a hint written backwards next to them. Unless players are careful it’s pretty easy to accidentally discover a hint. While it’s great to have the ability to play without an app, it would be excellent to have a mobile app allowing players to access clues without the chance of seeing clues they aren’t looking for. Include copies of the score sheet (card 6 in London, 7 in Test Time), or make one that multiple patrons can use in sequence to replace the existing one. Another possibility would be to put that card in a card sleeve/ziploc bag, or laminate it; either way include a dry erase pen. It’s also a great idea to include additional card sleeves for cards that include puzzles more easily solved by writing on the card. Even though the Deckscape games don’t get our highest marks for puzzles or hint systems when compared with some of the other boxed rooms these quick and affordable escape experiences are great candidates for inclusion in a school or library, if you have have someone to sort them every time they are played. Join us in the Library Escape Room Enthusiasts group to discuss this review or join in other conversations about using escape rooms in libraries. Posted on March 7, 2018 by Donald Dennis and filed under Escape Rooms and tagged Deckscape escape room tabletop. If you are looking for the most realistic escape room experience then this is the one. The Werewolf Experiment has locks and other common escape room gizmos that would be a bit too spoilery to discuss. 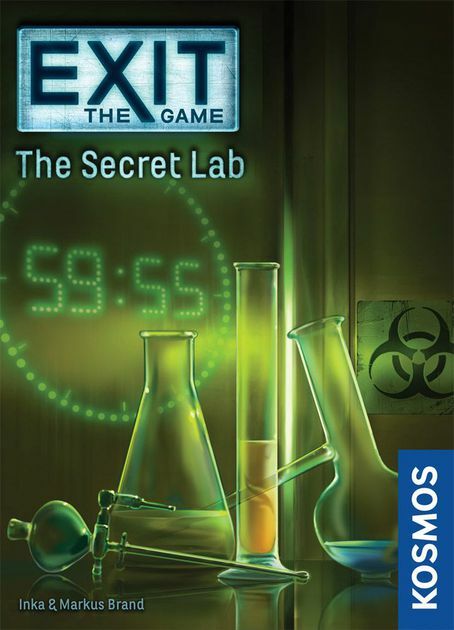 The game has a relatively strong narrative and is a neat twist on the mad scientist room. The best thing about the Werewolf Experiment is the way they structure the puzzle chains; larger groups can stay engaged in puzzles instead of just one or two players like in many other escape activities. The Werewolf Experiment really works well with a group of up to six or possibly even eight, without feeling like it’s being stretched at the seams. The same puzzle structure makes it really tough to complete in the time allotted with only two players. Speaking of puzzles, there is a good variety of puzzle form and quality for a tabletop experience. The designers packed some very interesting puzzle props into the box, and the puzzles range from easy and silly to quite challenging. Some will probably need more than one person to examine them before being solved, but that's the nature of escape rooms. If they hit a wall and cant proceed, the players have a hint booklet that they can reference a certain number of times during the escape “without failing”. It does a great job of spurring things along when players need help. There is a second hint booklet that appears later to help with the final puzzles, and dividing the hints that way helps to prevent accidental spoilers. While many of the other tabletop escape rooms play out like normal game experiences, it is easy to tell the designers want their escape room to be an something more. Nothing shows that more than the Werewolf Experiment website where they have party tips, printable labels, invitations, a "SUPER RAD SOUNDTRACK", a bonus puzzle, and repacking instructions. To sum up, Escape Room in a Box: The Werewolf Experiment is the closest thing to a real escape room currently available as a tabletop experience. It would be an excellent core to an escape room event, but our recommendation is to buy two copies, play through it once, and laminate the pieces which require writing on the second set. This would provide additional backups for any elements that might go wrong. With a very high percentage of good quality puzzles and the ability to keep more than two or three people engaged at a time, this is recommended for a big event, if not necessarily as a permanent part of a circulating collection. For additional information about Escape Room in a Box and the people who created it, check out On Board Games # 276: Escape Experiment where Donald Dennis talks with Juliana Patel and Ariel Rubin, designers of Escape Room in a Box. This review is based on the first version of Escape Room in a Box: The Werewolf Experiment. We have not played or examined the Mattel version. Posted on February 28, 2018 by Donald Dennis and filed under Escape Rooms and tagged escape room tabletop. Think Fun's Escape the Room: Mystery at Stargazer's Manor, is the first escape room themed game ever published. For a first take it does so much so well. Even though none of the current generation of escape room games are re-playable by the same person, because of spoilers, this series can be repacked and played by other groups. Players can easily complete all of the puzzles in either Mystery at Stargazer’s Manor or The Secret of Dr Gravely’s Retreat without destroying any of the elements meaning it can be packed up and returned to the box so it is ready for the next play. This series set the tabletop escape room standard of “game teaches itself” as you start to play, but it does so without neglecting the narrative element. The starting scene card sets the stage and then over the course of the room players open a series of envelopes by solving puzzles. In each are more puzzle pieces and a card advancing the narrative by explaining what happened in the world they are exploring. Once players believe they have solved a puzzle they enter symbols they discovered into a solution wheel, which will show if it is actually solved and players can move on. The one potential failure of this clever mechanism is how easy it is to brute force the answers, or even say “hey, look, we succeeded” and move along. Most groups don’t cheat, instead relying on clues from the website (or a friendly teacher or librarian) to get them through any tough spots. The website supporting the Escape the Room games is only essential during play if players need hints. Besides the a hint system, it also has background music selections to help set the atmosphere, and a map for resetting the game. Unless there is someone present who has already played through the room internet access may be essential for players to complete the rooms, let alone to have an enjoyable time. The one unfortunate element of this series is the linear nature of the puzzles that prevents them from being suitable for groups of larger than three or four. Four tweens or three adults who enjoy puzzles can have an interesting time completing these in about 30-45 minutes, but if you have five players someone is going to be bored. Players should also be aware that both of the current Escape the Room sets have one puzzle that is significantly harder than the others included in the box. Because most of the puzzles in the series are not extremely difficult Escape the Room gets a Green Light as an amazing “first escape room experience” for small groups, and is a great introduction to what real rooms have to offer, or even what can be expected from other tabletop experiences. The puzzles in Dr. Gravely's Retreat are a just a bit more difficult, making the the perfect follow-up to the Mystery at Stargazer's Manor. Posted on February 23, 2018 by Donald Dennis and filed under Escape Rooms and tagged escape room tabletop Escape the Room. These are some of the games we will be covering in our escape room series. Games in Schools and Libraries is kicking off a new series on escape room related products for our blog. In our subsequent articles we will cover the breadth and depth of store-bought tabletop escape experiences, print and play activities, and even games that aren’t (strictly speaking) in the escape room genre but still evoke enough aspects to appeal to the same audience. Few experiences are more engaging than escape rooms, solving puzzles and overcoming obstacles are made even more enticing by the physical nature of the activity and the race against the clock. There are a variety of pre-packaged escape products that aim to reproduce one or more of the essential elements of the escape room experience, such as cooperative puzzle solving, critical thinking, and doing all of this under the clock. Many of the tabletop products we will be covering have novel takes on many of the same problems - how to present a series of puzzles in such a way that players can continue to progress in solving interesting problems without getting stuck in such a way that the experience is destroyed by an insurmountable feeling of bafflement. Should players get truly stuck there is no sympathetic Game Master to deliver hints, but all of the games in the escape room genre have had to deal with this issue, frequently finding unique ways to present hints or allow players to progress even if they can’t follow the designer’s sense of logic. We will be talking about all of these issues over at the Library Escape Room Enthusiasts group, and even discussing some of these games before the reviews are posted. If you have something to say, or are just looking for more opinions after the blog post has dropped, that’ll be the place to go. Posted on February 22, 2018 by Donald Dennis and filed under Escape Rooms and tagged escape room tabletop blog series review. If you've listened to the podcast you know that we love escape rooms and utilize them in our programing in the Georgetown County Library System. I’ll be posting our puzzles here and in our facebook group Library Escape Room Enthusiasts. The first batch of puzzles I’ll be introducing are from The Gray Man, a Local History Escape created for the ALA Escape to the Library Preconference. Today I’m talking about the Cube Puzzle. According to the fine folks at Monticello Thomas Jefferson created a Wheel Cipher designed to encode and decode messages. Inspired by that, but limited by a modest budget, I created code cubes as a puzzle for our local history escape that would open a word lock. The cubes waiting to be assembled. The cubes had holes going through two opposite sides, so they could be placed on a rod, then images of period relevant items, opposite each other on two other sides, and then letters on the two other remaining sides. To obtain the answer they would need to stack the cubes on the rod in the correct orientation and then spell out the appropriate word. Indigo on one side, rice on the other. For an extra twist I put two words on the cubes to highlight some of South Carolina’s agricultural history. This puzzle was crafted to make the connection about the way indigo and rice were used as complimentary cash crops in SC, because they required work during different seasons. The images were thematic flourishes, which I'd change to be more agriculturally related if I were re building the puzzle. Because this puzzle was crafted for a 20 minute escape experience the letters for the two relevant words, INDIGO and RICE were each in their own color, with indigo in blue and rice in yellow. Perhaps because of the boldness of the blue, most participants tried putting indigo in the lock first but found it was too long, and then discovered that rice was too short. Further examination of the puzzle revealed that by spelling out indigo on one side, and flipping the cubes over, the cubes would reveal that there was a blank side after the world RICE and a picture of rice before it. (Yellow was especially appropriate because it very closely matched the color of the Carolina Gold strain of rice.) The solution to open the lock was RICE_, with a blank after the word. Images from other elements of local importance, hand drawn to look as if it were a hand-crafted toy. This puzzle was much easier to solve for novice escape room participants just based on how it was presented; all of the cubes were discovered in the same place. The post cubes stack on was glued into the first cube with a little wood chit on the end to hide the hole, while the last cube also had a chit indicating that it had to be the last piece. To create a longer escape room experience the difficulty/time-required could be increased by scattering the cubes through other puzzles, not color coding the words, or adding extra blank/ornamental cubes at the two ends of the post so participants would be unsure about which letter or was first and which was last. In all I’d consider the cube puzzle reasonably successful. It was tactile, theme relevant, very versatile, and the puzzle pieces felt like they could have been setting appropriate. The best way to improve this kind of puzzle would probably by having the solution word be of the correct length without any blanks, but as long as you know how to signal that there is a blank on the word lock it is not a deal breaker. Let me know if you use this crafty little puzzle, and how you improve on the design. Posted on October 2, 2017 by Donald Dennis and tagged puzzle DIY escape room.